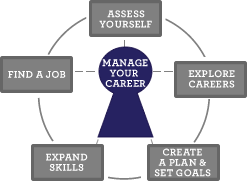 M Manage your own work life: You are in charge of your career. O Options and opportunity: Be aware of your choices and be ready to act on them. T Training never ends: Keep updating your skills and learning about your career field. I International mindset: Value different cultures. Think about the economic and work trends in other countries. Think about how they affect your work. V Value all work: It shows that you place worth on your time and yourself. A Achievement: Do the best job possible, set and realize your goals. T Technology: Know how to use computers. Stay current with new technology. E Economics: Understand how the economy affects you. It impacts the job market and your career field. About Us | Contact Us | Site Map | Copyright © 2010 - 2014 IAJVS.